The Day of Resurrection is probably an opportune moment to pause and gauge the pulse of the market. After the forgettable dalliance with 2011, risk assets seem to have found an amenable ally in 2012 so far. Tepid interest from FII towards India in 2011 has been replaced by renewed fervour ($9 billion net inflows in 1Q2012 v/s -c.$1 billion net outflow in 2011). Interestingly, very little has changed fundamentally. The March budget was a damn squib, with the Finance Minister hoping to walk the tight rope between taming inflation, curbing a burgeoning fiscal deficit, without fettering growth. The Budget was, however, low on major reforms and irksome issues continue to make their presence felt. Yet, FII continue to pile in. One of the intriguing things about human behaviour is its stickiness in altering the status quo prevailing bias. After a prolonged period of bull market, bearishness/pessimism is a rarity; likewise, after a bearish period, bullishness/optimism is a rarity. Bull markets are fuelled by optimism, which is confidence's child. The circular relationship seems to portend that confidence is a necessary prerequisite to bull markets. This needn't always be the case. When much bearishness is already imputed in prices, a minor dose of optimism is enough to take prices higher (converse is true around market tops). In temporal terms, optimism is a short-term phenomena, while confidence is more structural. Tangible on-the-ground improvement in business environment is a necessary catalyst to support sustained confidence. Quick glimpse of the thermometers that I keep an eye on to gauge sentiment. Is the bull market here? Or, is this a temporary oasis of optimism? Commodities, except Crude Oil, had a stellar January '12, as the risk-on trade gained backers on the possibility of QE3 favouring risk assets. February was quieter and March proved to be speed-breaker to budding optimism. The price performance of Healthy v/s Weak companies is a useful indicator of market participant focus of interest. 'Healthy' contains debt-free/net cash balance sheet companies, 'Weak' contains the most indebted ones. After a spell of negative price performance, a spell of optimism generally favours the indebted over the conservative. The debt-heavy tend to fall so greatly in a bearish environment that a temporary reversal in sentiment is enough to propel these pockets higher, as participants cycle out of defensives. As always, sustenance is key to gauge a structural shift. 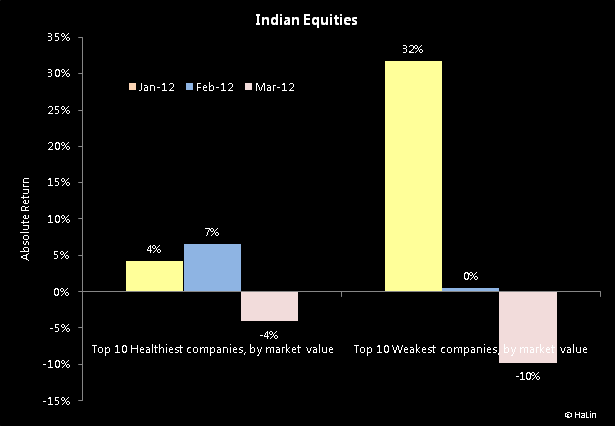 January '12 was very favourable to the Weak companies in my index but follow through has been stolid. February saw the Healthy beating the Weak and March turned out to be inglorious for both, more so for the Weak. One of the companies in my Weak pack is Kingfisher Airlines (Bloomberg: KAIR IN, NSE: KFA), which is sparring with possible bankruptcy. Gauging behaviour is one of the most challenging aspects in investing. Numbers convey a picture and they have their utility as communicators of market sentiment. But they cannot conquer uncertainty. Just as a good doctor, with experience, is able to ascertain much about a patient's health by inspection and smell (yes), a market practitioner does the same with the market. With the likelihood of QE3 remaining shrouded in speculation, commodities are likely to experience bouts of volatility, driven by the vicissitudes of QE3 banter. India, meanwhile, may track developments on the interest-rate front, with a rate cut fuelling optimism. For now, optimism needs a pair of strong legs, something that seems in short supply, to morph into confidence. Nice observation on the commodities prices. What about 6 month (Sept) long positions on Gold and Oil? Don't they seem to be a good bet to get into now? 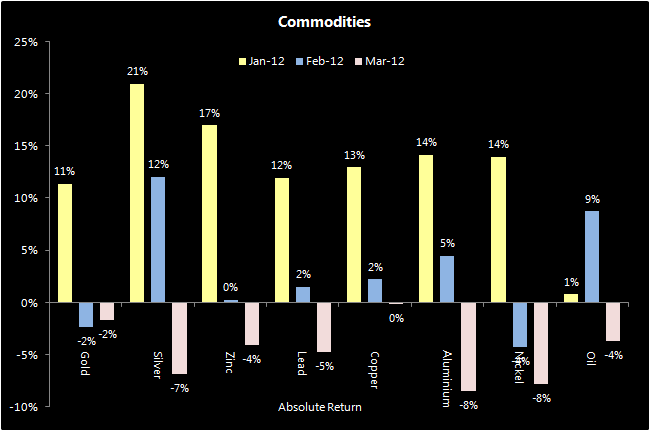 6 months is a long time in the commodities world. Commodity Futures presently do not allow one to take positions for that long a period. If you are bullish on Oil, you might want to consider Oil exploration companies whose earnings correlate highly with Oil prices. It isn't a pure commodity opinion but comes close. You could, of course, buy physical Gold if you are ready to hold for a period. I have no view on Gold or Oil at the moment.